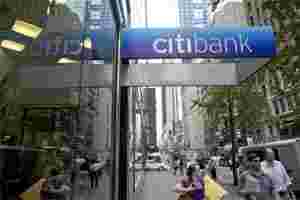 Charlotte, N.C: Citigroup Inc reported higher third-quarter earnings on Monday as the bank set aside less money to cover bad loans and recorded an accounting gain banks can take in turbulent markets. Citigroup, the third-largest US bank by assets, reported net income of $3.77 billion, or $1.23 per share, up from $2.17 billion, or 72 cents per share, a year earlier. Excluding that gain, Citi earned $2.6 billion, or 84 cents per share. It was not immediately clear if the results were comparable with analysts’ average earnings forecast of 81 cents per share, according to Thomson Reuters I/B/E/S. The bank - which received two US government bailouts at the height of the financial crisis - is seeing its problem loan portfolio shrink. Nonaccrual loans fell to $7.95 billion from $12.46 billion in the same quarter last year. The bank’s share price has fallen about 40% this year, in line with declines for other large banks.